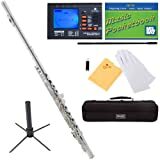 Mendini MFE-S+SD+PB+92D Silver Plated Closed Hole C Flute with 1 Year Warranty, Case, Tuner, Stand, Cleaning Rod and Cloth, Grease, and Gloves (UPC 847848017377) is sold at the following online stores. We've find the latest prices so you can compare prices and save money when making your purchases online. Please click on the links below to browse to each store's webpage.